MapleLeaf Technologies has a proven track record of providing custom application development and maintenance services to its clients in various industries, with an ability to handle large enterprise systems and provide cost effective and on time support. We provide end-to-end software development solutions – right from conception to production promotion. We strictly follow Agile methodology, this helps us meet our clients requirements by delivering SOLID product within expected time and budget. We excel in varied technologies and follow well proven design patterns which leaves ample scope to alter and extend the platforms in future. One key attribute of our software development process is our flexible, customized approach towards each project and customer’s need. Our standard process is defined for typical scenarios, but we customize each project based on your business goals and requirements. With a strategic focus on and commitment to Microsoft technologies, we offer flexible, cost-effective access to top-notch software development resources. Those include our team members, who are skilled not only in our target technologies but also in agile development methodologies. Our resources also include our collection of pre-assembled software components, our reusable engineering tool set, and our reusable architectures —all of which dramatically improve the speed and efficiency of Microsoft-based development projects. In other words, integrate information technology (IT) and operations technology (OT) to forge a stronger manufacturing organization—a state that we and others refer to as Industry 4.0.7 Also known as SMART manufacturing or Manufacturing 4.0, Industry 4.0 is marked by a shift toward a physical-to-digital-to-physical connection. For MapleLeaf Technologies, quality is milestone. It is an integral part of our business policy. Our Quality Management Process (QMP) defines project management and software processes. It formally documents project management and engineering processes; waterfall, iterative, and agile development methodologies; and best practices throughout all phases of development, right from conception to delivery. Project management, including planning, defining Business requirements documents and supported Business rule catalogue (BRC), scheduling, project monitoring,reporting, communication, and issue resolution. Software engineering, including configuration management, requirements development, design, and unit and system testing. 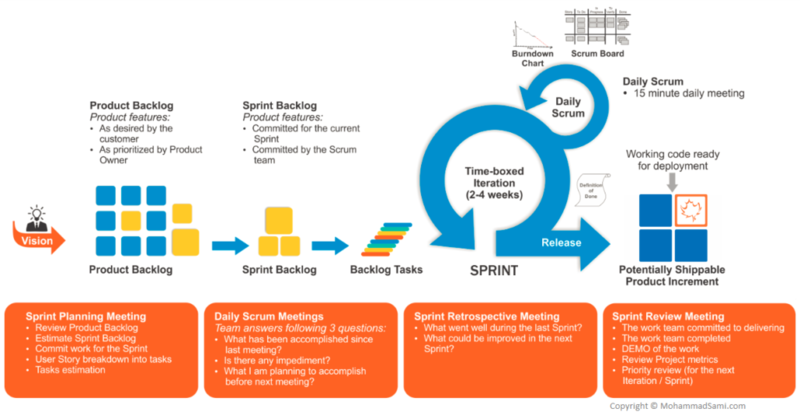 Development methodologies, Agile SCRUM normally followed for new development and Kanban for production support and maintenance. Comprehensive quantitative process measurements and control, including productivity measurement, as well as schedule and effort variance tracking. Best practices throughout all phases of development. MapleLeaf’s team, processes, and technology are the foundation of our world-class software development services.